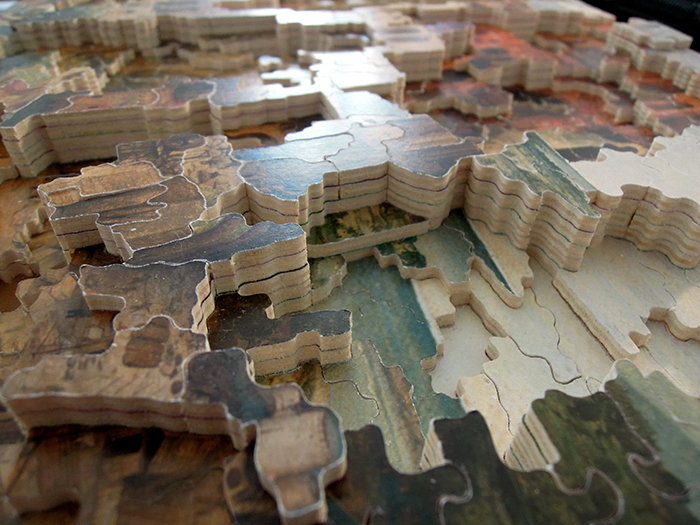 Jigsaw puzzle, wood, 37 x 27 x 1,7 cm. The work Untitled (The Tower of Babel) is made of seven layers of jigsaw puzzles. The first layer shows The Tower of Babel as painted by Brueghel. The pieces that are missing reveal the lower layers which in turn show enlarged scenes of the initial picture. At first, the work looks like a visual enigma. Although the image seems familiar, it doesn’t lend itself immediately to a full understanding. The superimposition of layers with different degrees of enlargement creates a composite image, a analog glitch while evoking the strata which are at work in the construction of a myth. The seven layers also refer to the tower of Babel with its seven floors unfolding, like a telescope, towards the sky. The new viewing devices alter our portrayal of the world. They allow for both panoramas (satellite pictures) and highly detailed close-ups (HD, drones). Does such an enhanced perception allow for a better understanding of the world or does it, on the contrary, lead to an illusion of omniscience liable to generate confusion?